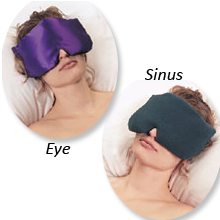 Designed to provide relief to those suffering from headaches, insomnia, or puffy eyes. COLD therapy only! Comes in 4 colors. Weighs 1 lb. Use hot or cold. The soft fleece allows penetration of the healing herbs and spices.